If week 13 was the week of goals from fast transitions off turnovers, week 14 has brought us long possessions, surprising goalscorers, and the return of an old friend. This goal is a microcosm of everything TFC is at their best. Already up a goal, the Reds patiently work the ball around until they find an opening, then they strike with lethal quickness, cutting through the Crew defense with ease. The attacking move really starts with Gregory van der Wiel spotting space and Giovinco. Perhaps even more important than the final ball he plays is the perfectly timed run Victor Vazquez makes to be in position for the assist. You can see in the replay that Vazquez spots Tosaint Ricketts’ run before receiving the ball from Giovinco, and that pass is the only thing on his mind when he does receive it. Speaking of Ricketts, there are clearly a lot of things going wrong for TFC these days (and believe me when I say the temptation to turn this into another “will TFC make the playoffs?” column is great) but he's is not one of them. One might even argue that Toronto would be no better off with a healthy Jozy Altidore than they are currently. Ian did a great job breaking this down (and looking at TFC’s defensive issues) in Expected Narratives last week, but it’s worth pointing out again, if only to highlight how underrated Ricketts is throughout MLS. To recap, Altidore, before getting hurt, was contributing 0.78 xG+xA (from the run of play) per 96 minutes in 2018, after putting up 0.54 xG+xA in 2017. Meanwhile Ricketts is contributing 0.77 xG+xA per 96 this season. On top of that, Ricketts is actually a better passer than Altidore as well, according to our Expected Passing metrics. The differences aren’t huge, but it again points to Ricketts doing a more than adequate job filling in for Altidore. You can watch the replay for a great example of a lethal counter-attack, something that manager Mikael Stahre would like to see more of from his Earthquakes team. I’d like to take this opportunity though to dive a bit deeper into the Chicago Fire defense. 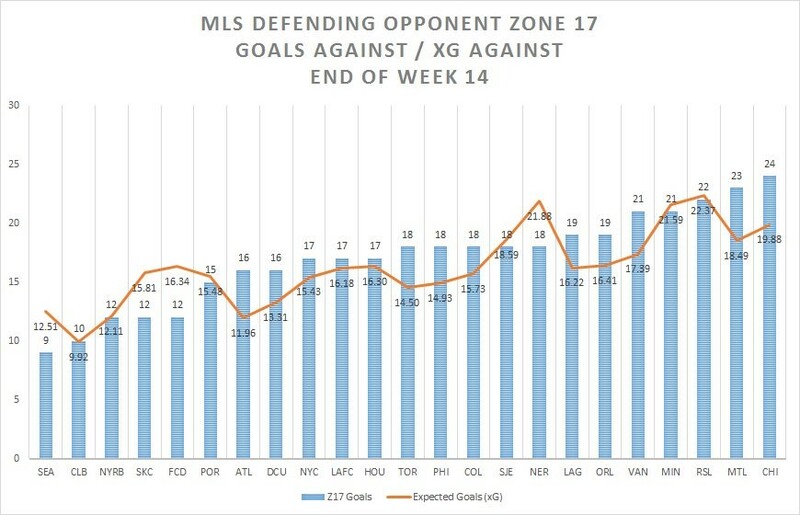 In his fantastic piece earlier this week on defensive pressure, Jamon Moore shared this graphic about the goals and xG for each team defending in zone 14. As you can see, Chicago are among the worst in MLS in xG allowed from zone 14, but have yet to concede from there. I got curious about that, guessing that a map of Chicago’s goals conceded from zone 17 might look pretty ugly. Spoiler alert, I was right. Jamon was kind enough to put that graphic together. Fire fans may want to avert their eyes. The heatmap from the Fire vs Earthquakes game (Chicago on the left, SJ on the right) gives another visualization of the amount of activity that Chicago allows in such dangerous positions. Chicago and San Jose heat maps. That big red blob in front of Chicago's goal is not ideal for them. Similarly, San Jose's green blob in front of Chicago's goal is also bad. Chicago did manage to win the xG battle on the night 2.13-1.96 (and the actual game 2-1), but the amount of activity for San Jose in such dangerous areas suggests that might have had more to do with the ‘Quakes lack of ability to find the final ball, rather than anything the Fire was doing. That the Earthquakes generated enough touches to show up in that bubble inside the 18 on the heat map, and only generated 1.96 xG (0.5 of which came on the above chance) has to be discouraging. This chance takes us back to the Fire’s midweek game last week against the Philadelphia Union, a 3-1 loss for the Fire, but it also brings us back to an old friend in MLS who’s been able to maintain a surprisingly decent scoring rate. It’s been a few years since I thought of Alan Gordon as relevant to anything important in MLS, and indeed, he hasn’t exceeded 1000 minutes in a season since 2015. That said, Gordon, in few minutes, has remained fairly dangerous. He’s managed to produce At least 0.5 xG+xA per 96 each year since 2015. He’s never quite recovered the form of that 2012 season where he scored 13 goals in that bash brothers attack (albeit, on only 6.2 xG), but has somehow remained a dangerous option off the bench the last couple years. So far in 2018, he’s become a reliable attacking option for the Fire, with his xG up to 0.53 per 96 and goals in consecutive games. I’m not going to argue that Gordon is a starting forward for a playoff team in 2018, but he's certainly been more productive than I (and many others) expected he would be. As with many things, I find something I want to write briefly about, and then someone else here at ASA goes and writes a full column about it (looking at you, Mr. xN). In all seriousness, Ian’s deep dive on Josef Martinez is very good and you should read it. I’m not going to call Martinez the greatest goalscorer in MLS, nor am I going to call him the most fortunate, but this does need to be said: for as good as Josef Martinez and Miguel Almiron were in 2017, they’ve been even better in 2018. Both are slightly below their xG totals for the year whereas both were above their xG numbers last year, but they are both better in almost every underlying statistic this year, suggesting things should continue to go well, and perhaps even improve, in Atlanta. Two things I want to specifically highlight in the table below. Martinez has almost the same xG per 96 as in 2017, but he’s doing it on 2.32 shots per 96, down from 3.93 last year. Almiron meanwhile has seen a jump in key passes and xA to go along with his increased xG as he gets seemingly more dangerous by the week. Teal Bunbury has been something of a revelation for the New England Revolution this season. Or has he? I went looking at Bunbury’s xG data fully expecting to see a huge jump in productivity in 2018, and to be honest was shocked to see he’s basically carrying on from the form he showed in 2017. Bunbury appeared in 28 games in 2017, but played only 1391 minutes. He’s already eclipsed his 13 starts from last year with 14 this season, and is already up to 1219 minutes, much to the benefit of the Revolution. Early in the season I think Brad Friedel earned himself a lot of skeptics by starting Bunbury over Juan Agudelo and guys like Kriztian Nemeth. Now the Revs are sitting 4th in the East and Bunbury is making Friedel look smarter every day. Finally, let’s wrap up with a bit of praise for the goalkeepers. New England’s Matt Turner has been having a phenomenal season, and he did it again against Atlanta last week with this stoppage time save that had a keeper xG of 0.84, the highest value save of the week in terms of keeper xG.